Hibbertia vestita grows naturally from Rockhampton in Queensland to central-eastern New South Wales. It is found just about everywhere in the south-east Queensland coastal region, as well as on the sandstone plateau of the Blackdown Tableland west of Rockhampton.. I have had a liking for yellow flowers ever since I saw the flowers of Senna artemisioides. 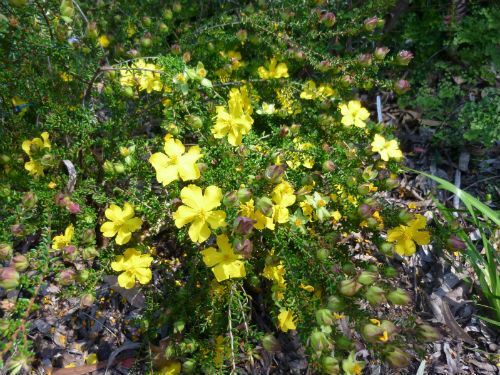 After seeing the bright yellow flowers on Hibbertia vestita, it became a ‘must have’ plant. I obtained plants from Westleigh Native Plants and have had a few of them growing for about five years in my northern Sydney suburban garden. They flower best when they receive almost full sun; however my plants still flower well with less sun than that. Hibbertia vestita is a fairly long-lived species, adaptable to most situations as long as the soil has good drainage. It appreciates the extra bit of water during dry times. Hibbertia vestita grows to 30cm high and about the same width. The 3cm diameter bright yellow flowers appear from spring into summer. It is an excellent rockery plant and every garden should have a few of them. However unfortunately, they are not always available commercially,. 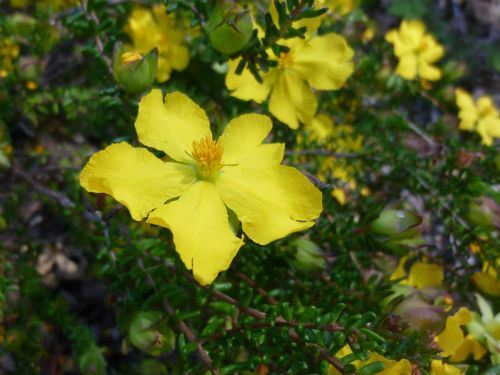 Hibbertia… after George Hibbert, a patron of botany. The species was first formally described and named by English botanist George Bentham, his description published in Flora Australiensis in 1863. vestita... from Latin vestio, 'clothed' or 'dressed', a reference to the hairy stems and foliage.